In recent years, it has become increasingly popular to go to market as an “eco friendly” company. Companies often develop product lines and marketing campaigns strictly to capitalize on the “green” trend. Werever did not go to market to exploit the green trend. 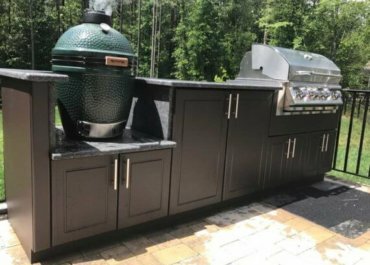 Werever goes to market with the purpose of building outdoor cabinetry for outdoor kitchens that are built to last a lifetime. However, Werever does in fact operate with an admirable record of environmental responsibility. We first became aware that we were actually an extremely environmentally friendly company almost by accident. An environmental services company solicited Werever to review our manufacturing facility for areas they could help with improving our environment related practices. The company realized rather quickly that we don’t have any hazardous materials or chemicals in our manufacturing process, so there wasn’t really room for improvement! Werever recycles 100% of excess material, cuttings, shavings, etc. They get recycled and become the inputs for other household products. Werever does not operate any paint, stain, or spray operations as our products do not require any special finishing treatment. 100% of extra material is recycled. Nothing goes into the trash. This includes every shaving from our CNC’s dust collection system, scrap material after cutting, and even the shavings from the floors around work areas. These containers are transported to the recycling company and are returned empty for us to fill again! There are a few special topics that are sometimes asked that have environmental implications. Why doesn’t Werever sell teak? Good, durable teak timber is harvested from trees 50-80 years old. Teak forests in Thailand and other areas have been decimated because of over-harvesting. Fast-grown “plantation teak” has emerged as an alternative, but the quality of these products is not as good as traditional teak. Teak requires regular maintenance with teak oil. This can be a very difficult and time consuming process that if skipped, will dramatically shorten the life of teak. Werever sell High Density Polyethylene (HDPE). Doesn’t that depend on petroleum? No. HDPE resins are sourced from natural gas, not petroleum. Most natural gas is still sourced domestically. The use of this product does not add to our economy’s reliance on foreign nations. Our products have an indefinite life. We believe it is acceptable to use a resource responsibly in a product with such a long lifespan. That is not the same as throwing away a plastic bottle after one drink of water for instance. If for some reason one decided they no longer wanted our cabinetry, the entire cabinet is recyclable. No portion of our product should ever wind up in a landfill. In summary, Werever does not take resources from the Earth irresponsibly. Anything we take from the Earth has an extremely long lifespan, and the byproducts are recycled.